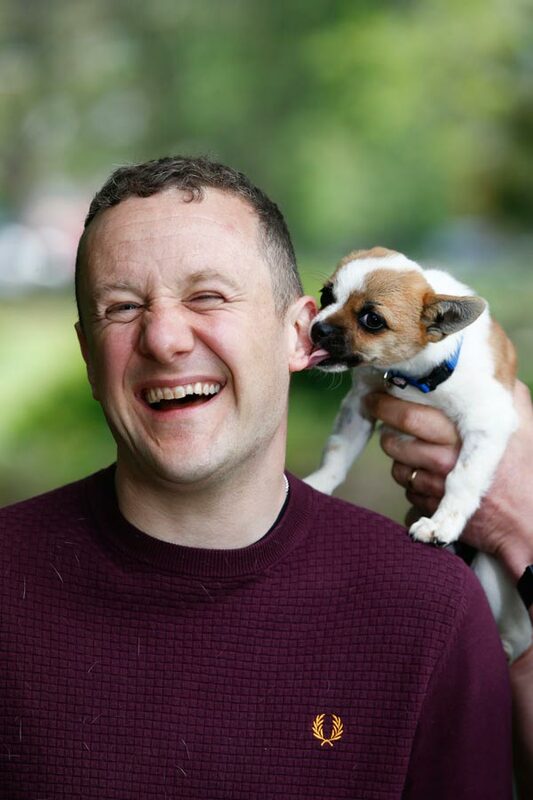 Top comedian PJ Gallagher is supporting the annual SpayAware appeal calling on pet owners to play their part in ending Ireland’s toll of unwanted cats and dogs. One of the country’s best-loved stand-ups, the Naked Camera star regularly has stage and television audiences roaring with laughter. But now he’s highlighting the message that with thousands of unwanted cats and dogs ending up in animal shelters every year, Ireland’s pet overpopulation crisis is no joke. PJ is joined by model Michele McGrath, vet and broadcaster Pete Wedderburn, and a number of ISPCA rescued animals at the launch of this year’s SpayAware appeal. Supported by the ISPCA, SpayAware is an annual public awareness campaign that aims to reduce the country’s high numbers of abandoned cats and dogs by persuading more owners to spay or neuter their pets. SpayAware highlights the issue through its dedicated website: www.spayaware.ie. As part of this year’s campaign, PJ appears in two eye-catching posters, one each aimed at cat and dog owners, which urge owners to take action by having their pets neutered or spayed. SpayAware also has the backing of Veterinary Ireland, with member vets displaying the posters in animal clinics and surgeries across the country. With the support of local volunteers, posters are also being displayed in animal welfare centres, local authority offices and pounds, pet stores and other community venues. ISPCA Chief Executive Officer, Dr Andrew Kelly said: “We are delighted that PJ has lent his support to the campaign. As a top comedian, he’s the perfect choice to convey the message that the pet overpopulation is no laughing matter. It is vital that all pet owners play their part in tackling this issue by ensuring their cats and dogs are spayed or neutered. While figures released by the Department of the Environment over recent years have shown a welcome downward trend in the number of dogs entering Irish pounds, many thousands of unwanted dogs continue to end up there. While no official figures are available for cats, based on anecdotal evidence it is estimated that the number of unwanted, abandoned and feral cats far exceeds the totals for dogs. "SpayAware is all about urging owners to act responsibly and neuter or spay their pets as early as possible to prevent unwanted litters of puppies and kittens. Although the decline in the number of cats and dogs ending up in pounds and shelters is heartening, it is still a significant problem and there is no room for complacency. At the ISPCA, we see the unwelcome consequences of pet overpopulation on a daily basis. The best way individual owners can help end the plight of abandoned cats or dogs is to ensure their pets are neutered or spayed. Don't wait until it’s too late, go to your vet - get it done now."